Carlos Checa continued his unprecedented run of form at the Miller Motorsports Park round with a brilliant race one win. The 39 year old Spaniard had to fight hard at the beginning of the race with Tom Sykes, Jonathan Rea and Marco Melandri but after hitting the front on lap eight he was never headed and won by 2.313 seconds after responding to a late charge by Melandri. 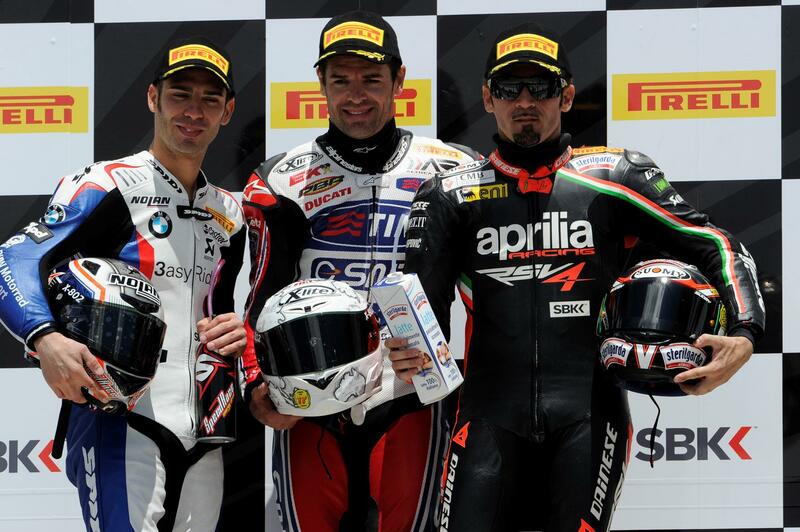 While Checa was expected to be fast the surprise of the race was BMW man Marco Melandri. The 28 year old Italian rode brilliantly to overcame a difficult weekend where he was plagued with tyre issue to go from ninth on the grid to second. His result is significant following his win and DNF at Donington park and he consolidates fifth in the championship standings. Max Biaggi was another man that delivered the goods on race day. Having qualified seventh, the Aprilia man had to fight hard with Honda Superbike rider Jonathan Rea and eventually secured third place to extend his lead in the standings to 13 points. Despite losing out on the podium it was still an impressive result for Rea and his fourth place marks an impressive turnaround in fortune at the American track. Eugene Laverty rode a strong race to claim fifth spot after a tough battle with pole man Jakub Smrz. Reigning WSS champion Chaz Davies secured his best result of his Superbike career with an impressive seventh place finish. The 25 year old finished just 19 seconds off winner Checa at the chequered flag. It was a disappointing race for Kawasaki man Tom Sykes after leading early on he was thrown out of his rhythm after a hard pass by Checa and soon dropped down the order, finishing eighth. Leon Haslam endured another tough Miller race onboard his BMW, unlike his team-mate Melandri, Haslam was unable to overcome the problems and lack of track time during qualifying and finished the race in tenth spot. Carlos Checa (Althea Racing Ducati) won an eventful race one at Miller Motorsports Park, Utah.